At Orange County CyberKnife, we’re proud to provide a wide range of world-class cancer treatments from our state-of-the-art radiation therapy clinic, including the industry-leading CyberKnife treatment. However, in addition to cancer treatment, we strive to help the Orange County community prevent cancer as well – and performing regular self-checks for skin cancer is an important part of that effort. If you’re wondering how to check yourself for skin cancer, we can help. When checking yourself for skin cancer, your main job is to look out for moles. 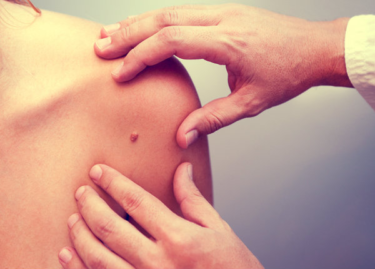 Most melanomas start as moles or discolored patches in the skin, so these are what to look out for. It’s also important to check your entire body – even places that aren’t exposed to the sun, as sometimes skin cancer can start here as well. To perform the check, start by making sure you have good lighting and a mirror (preferably both a full length and handheld mirror), then undress completely. Use the mirrors to thoroughly examine every square inch of your skin. As you check, look out for moles and discolored patches in the skin. You’ll want to examine for new moles and discolorations, but also check old ones to see if they’ve grown in size, changed shape, or changed color – all of these can be signs of skin cancer. C for Color: There are multiple colors within the spot, which may include red, blue, brown, black, white, or gray. Any mole or spot that matches any of these characteristics could be cancerous and should be evaluated by a dermatologist. The earlier skin cancer is detected, the less dangerous it is – so it’s important to make an appointment right away. To maximize protection, you should check yourself for skin cancer about every 3 months. If you’re at an increased risk of skin cancer, you should supplement these self-checks with professional exams from a dermatologist once a year. Talk with your doctor to determine the ideal prevention regimen based on your own history. Regularly checking yourself for skin cancer is one of the most effective steps you can take to protect yourself. If you have more questions about protecting yourself from cancer, we’re here to help. Contact us today to learn more about how you can reduce your risk of cancer, or to schedule a consultation if you’ve been diagnosed. We look forward to hearing from you and helping you win the fight against cancer!